The Israeli occupation army violated the Egyptian-brokered ceasefire in the Gaza Strip and continued to carry out aerial and artillery attacks last night and at dawn Tuesday on several targets. 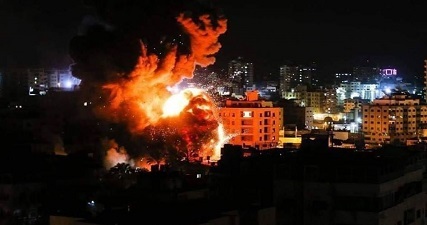 Correspondents for a news agency reported renewed airstrikes on different areas of Gaza, saying the Israeli attacks started, following the agreed ceasefire, at 10:50 pm on Monday and continued until 05:50 pm on Tuesday. Such Israeli violation happened after Egyptian mediators intervened and announced a ceasefire starting at 10 o’clock on Monday night between the Palestinian resistance factions and Israel. The resistance factions in Gaza also asserted last night, through their joint operations room, that they would respect the ceasefire as long as the Israeli side did not violate it. Earlier on Monday, five hours of Israeli aerial attacks caused widespread destruction in civilian areas and to infrastructure belonging to the resistance, and wounded many citizens.